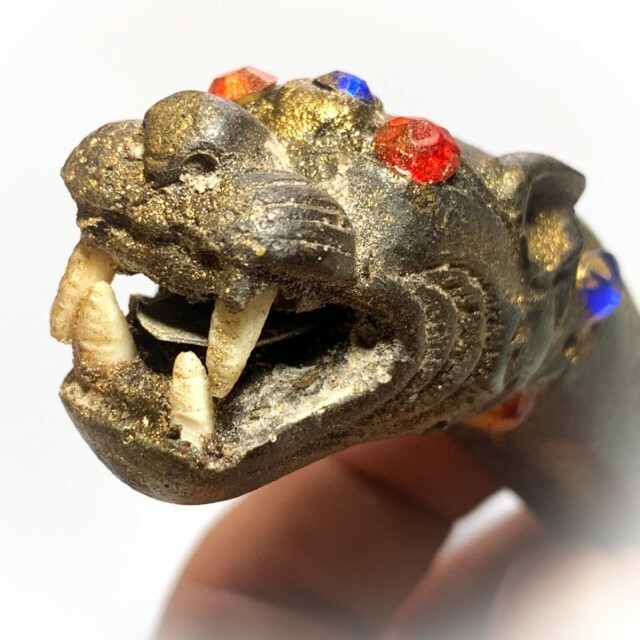 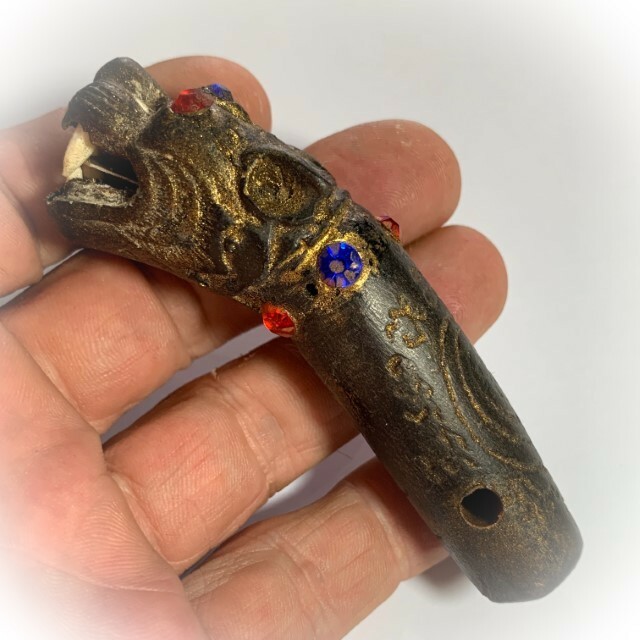 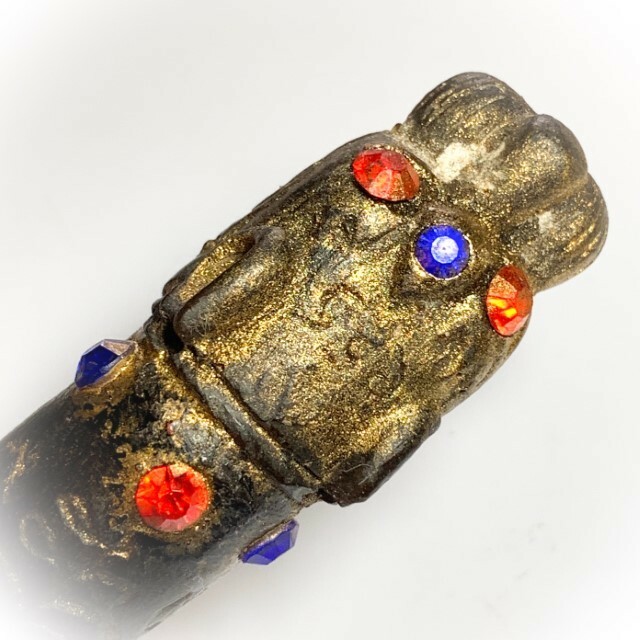 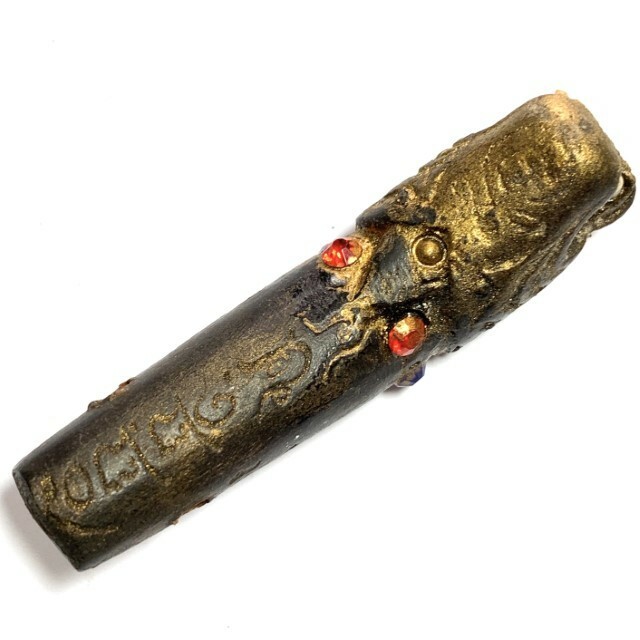 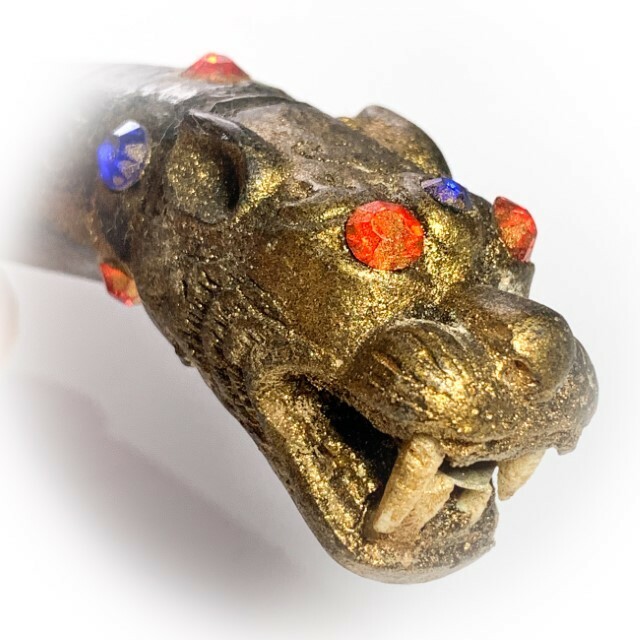 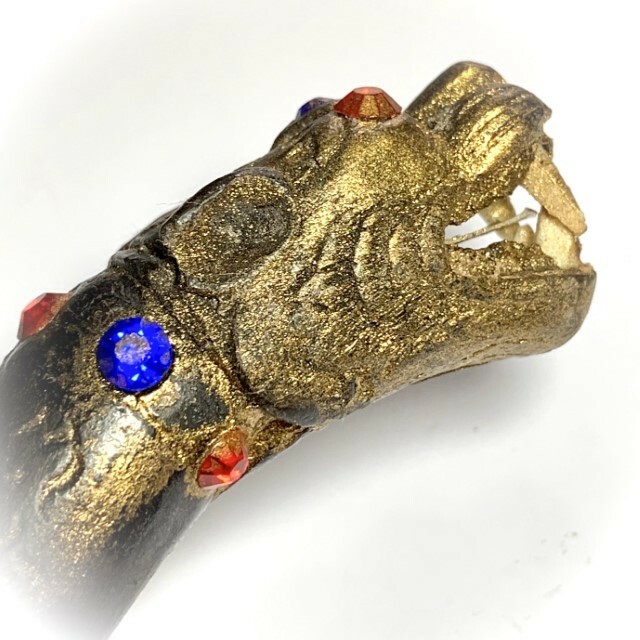 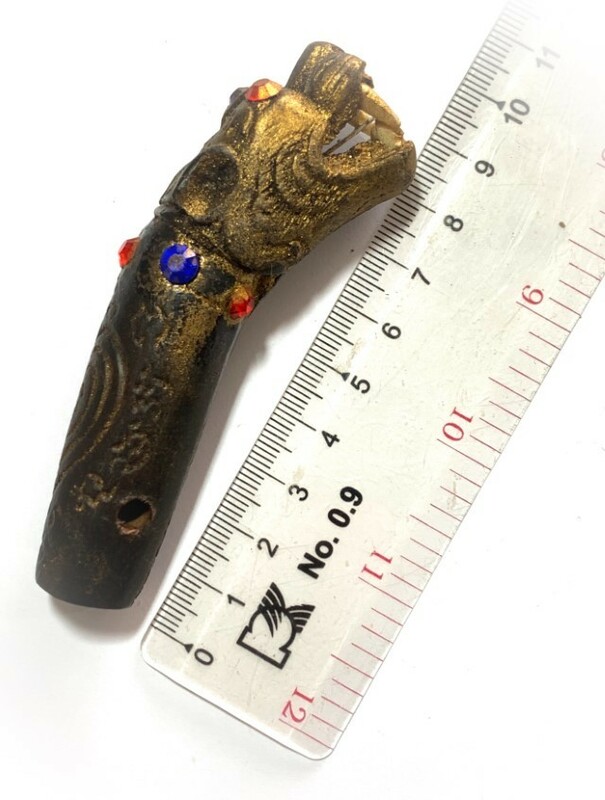 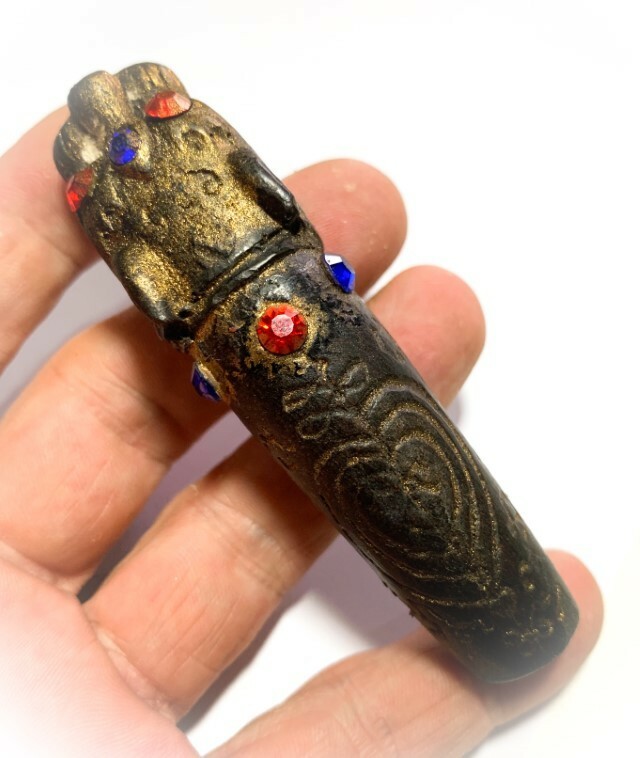 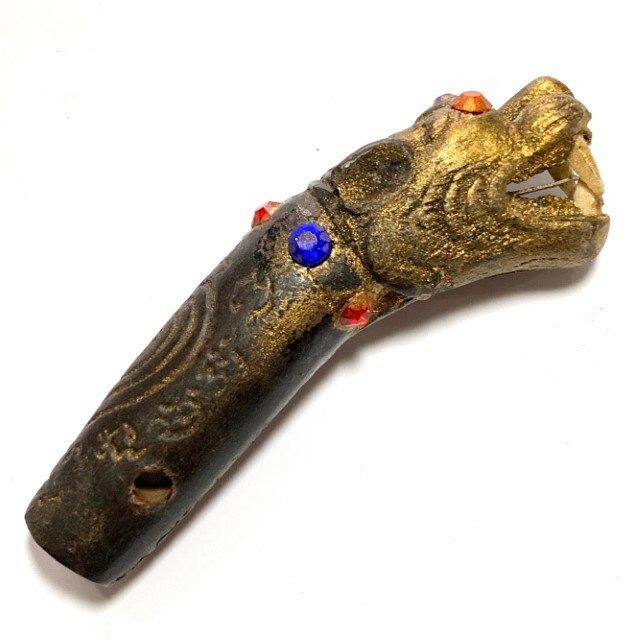 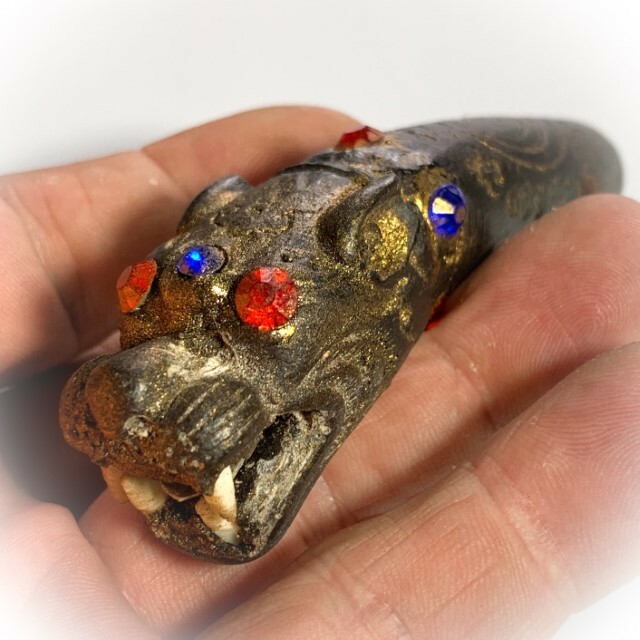 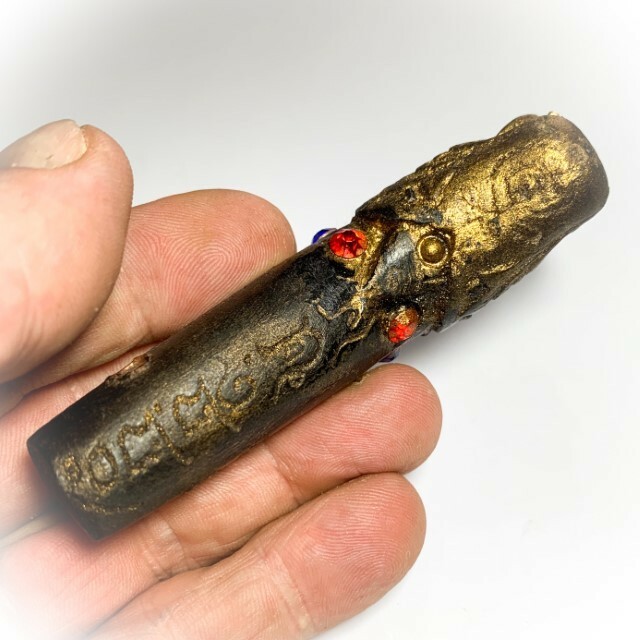 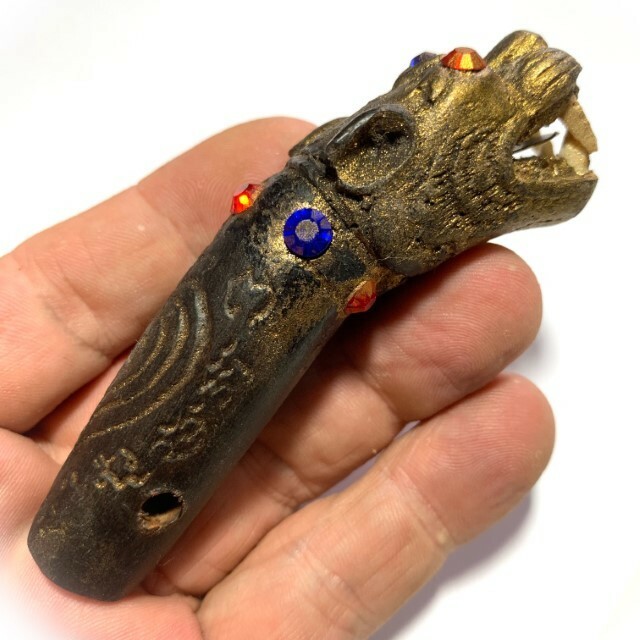 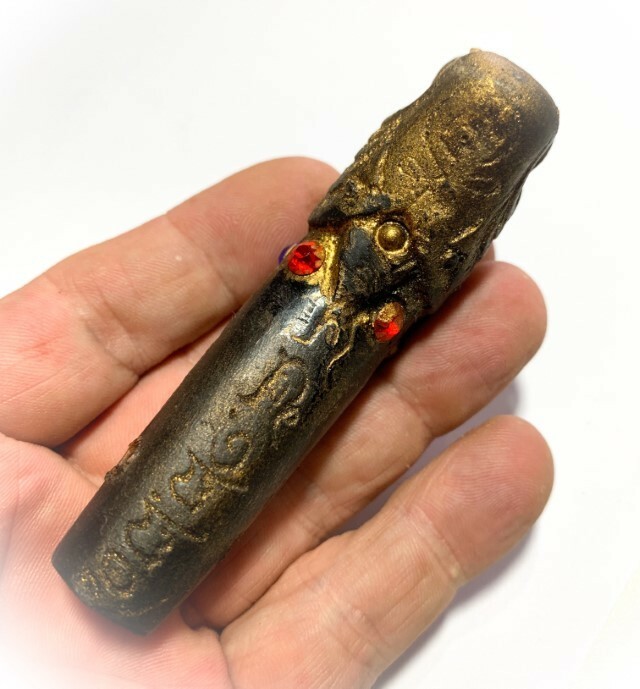 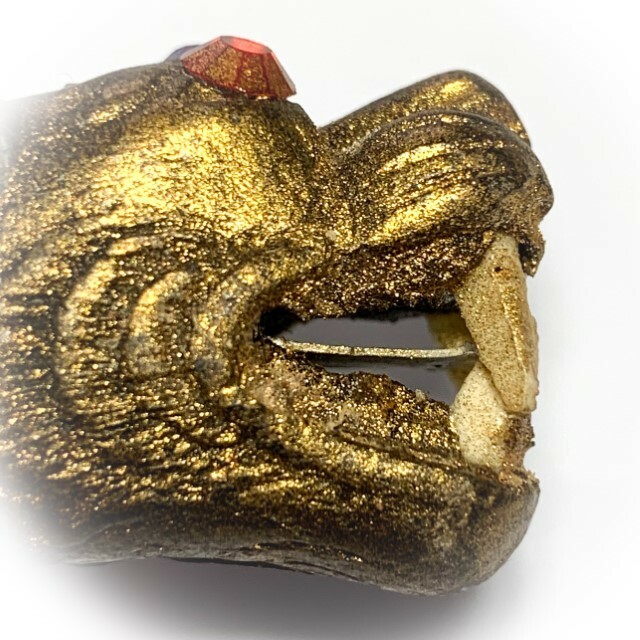 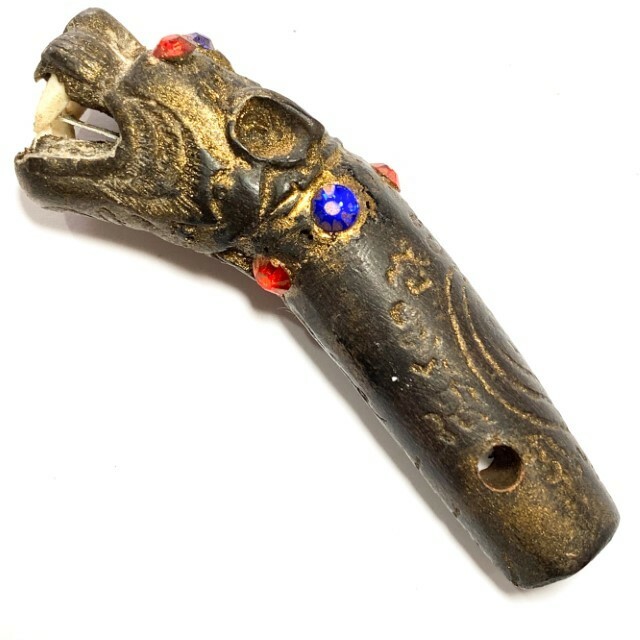 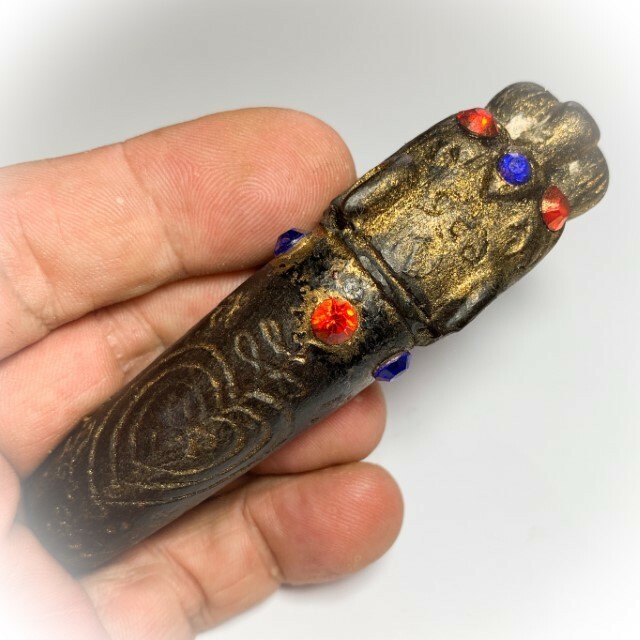 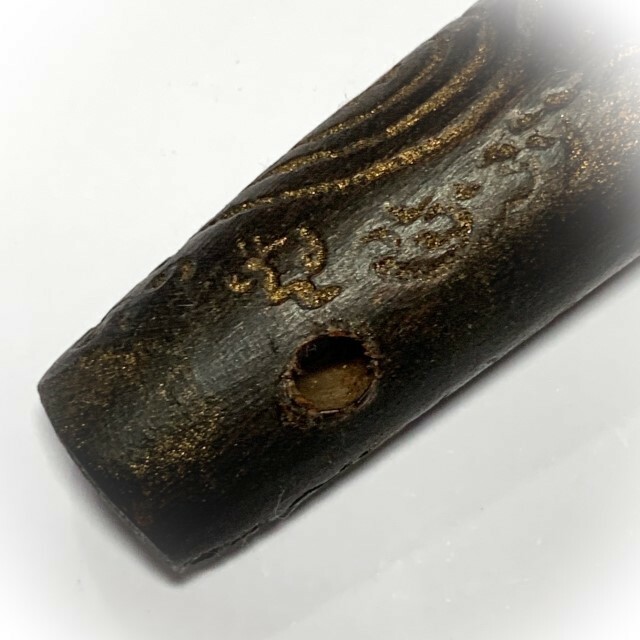 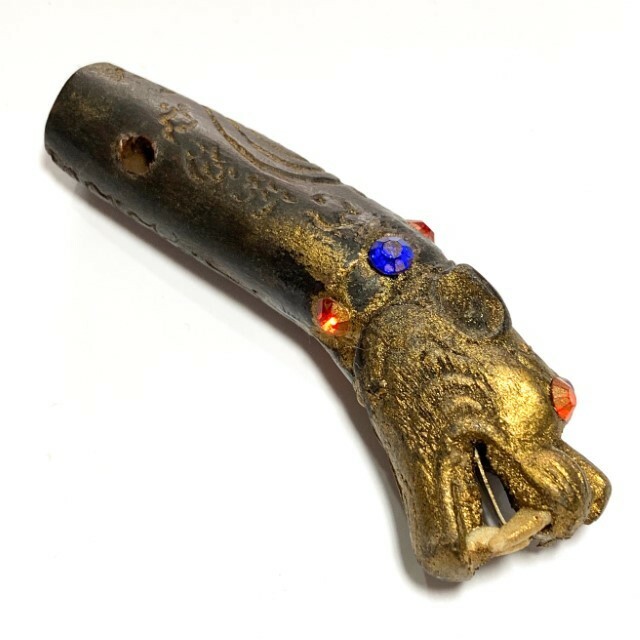 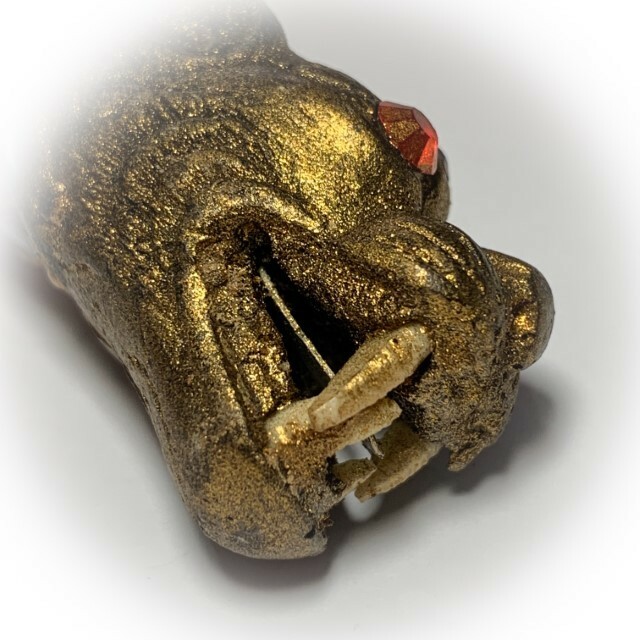 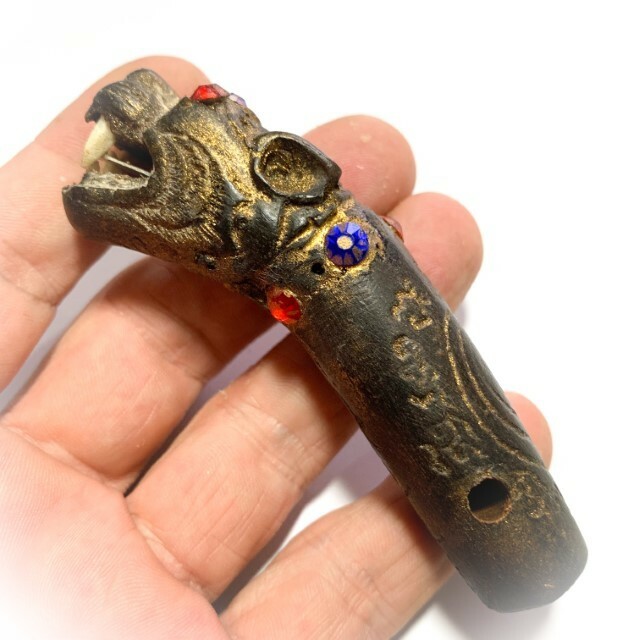 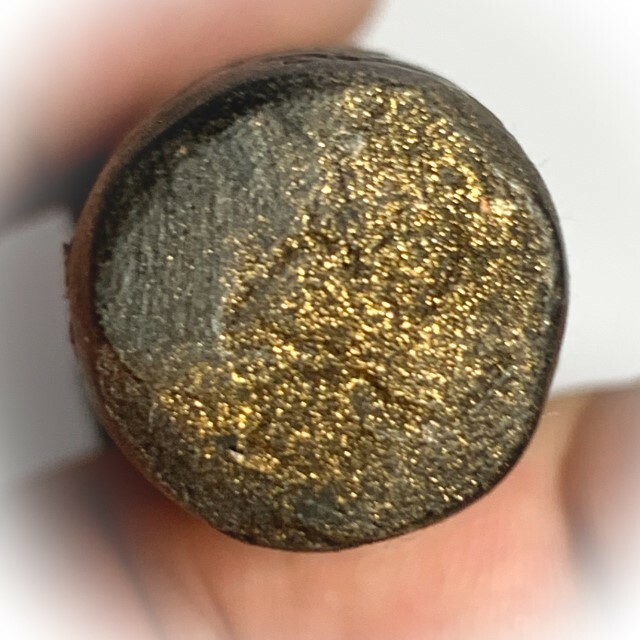 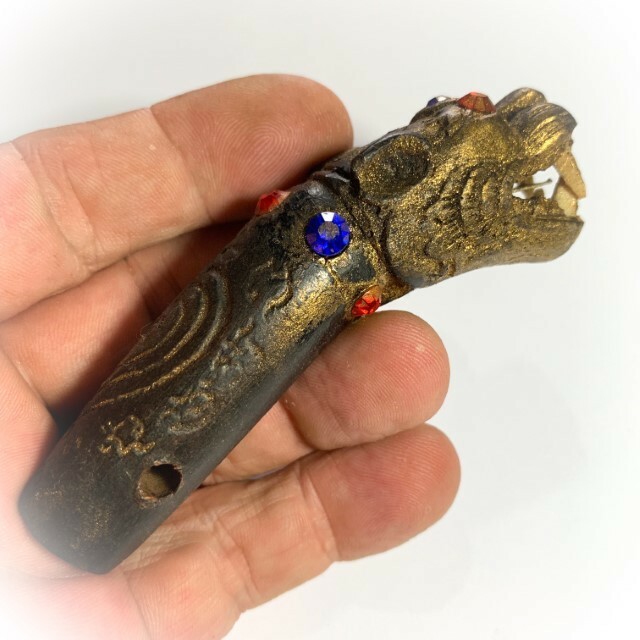 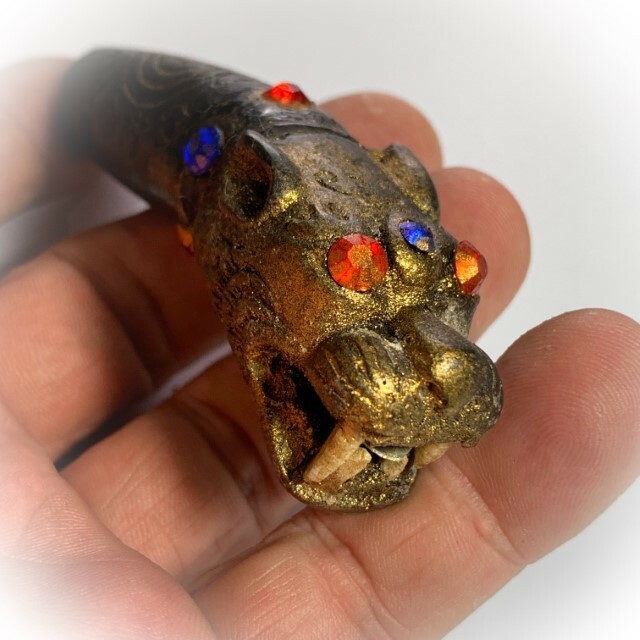 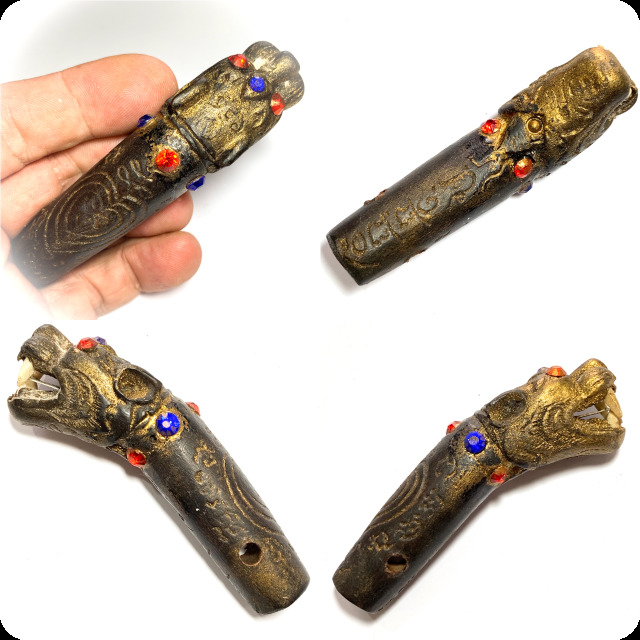 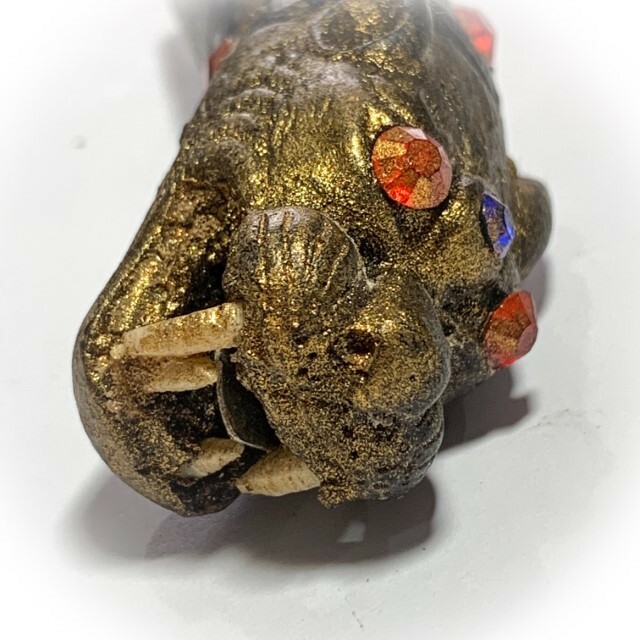 When speaking internationally, we behold here a most beautiful example of one of the Most Famous Palad Khik amulets of all time, and one of the rarest and most sought after; The Palad Khik Hua Chamot Mai Gae carved wooden Palad Khik of Luang Por Pina (Wat Sanom Lao), with gemstone eyes, Kring Bead Insert (rattles when shaken), silver Takrut spell as the tongue, and real teeth inserts., with hand inscriptions of the Sacred Yant Na Ok Dtaek, and the invocation of the four elements. 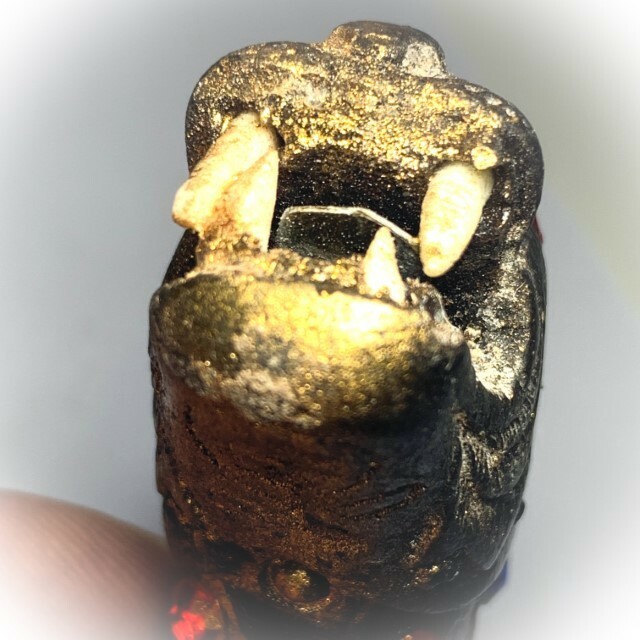 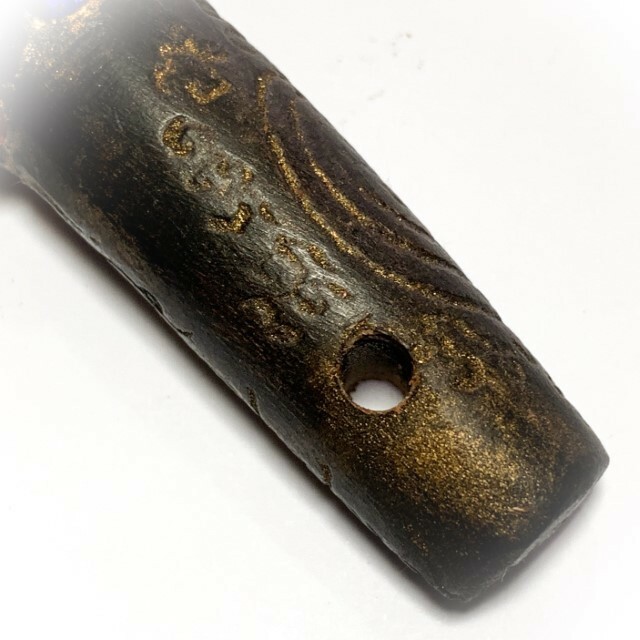 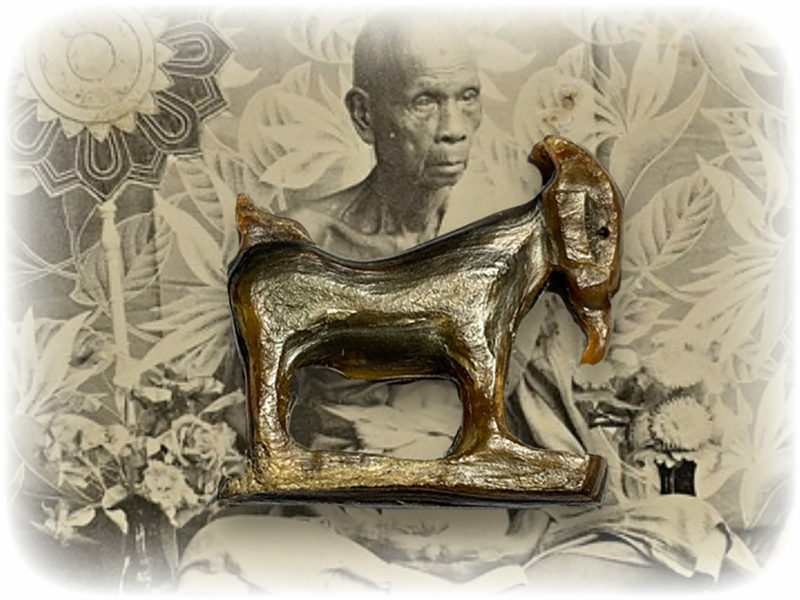 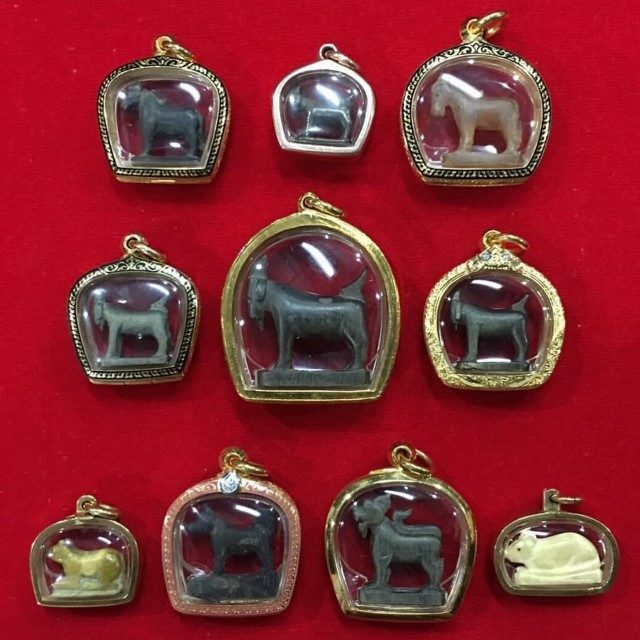 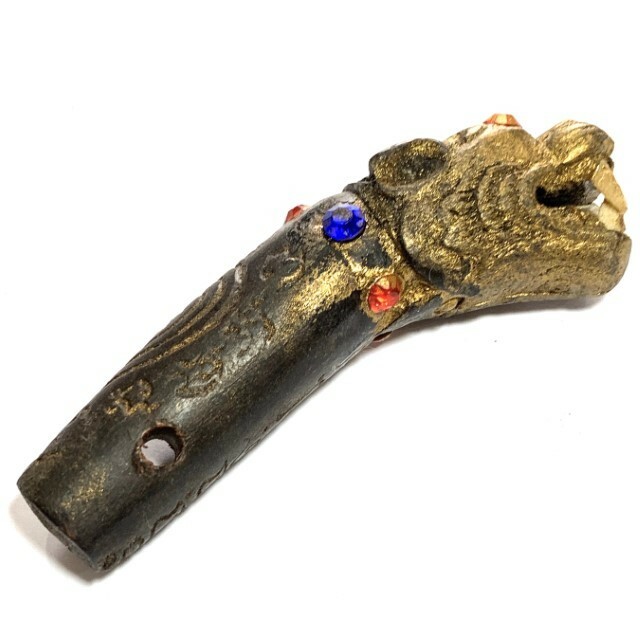 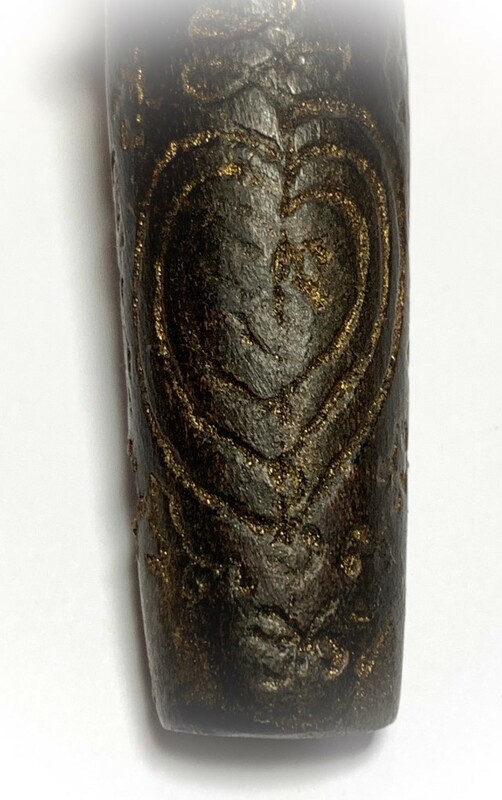 Some have said that the integration of Pre-Buddhist beliefs and traditions, into the Thai Theravada Buddhist practice of the common Folk, such as worshiping amulets like the Palad Khik, is not in contradiction to the practice of Buddhism and presents no obstacles. 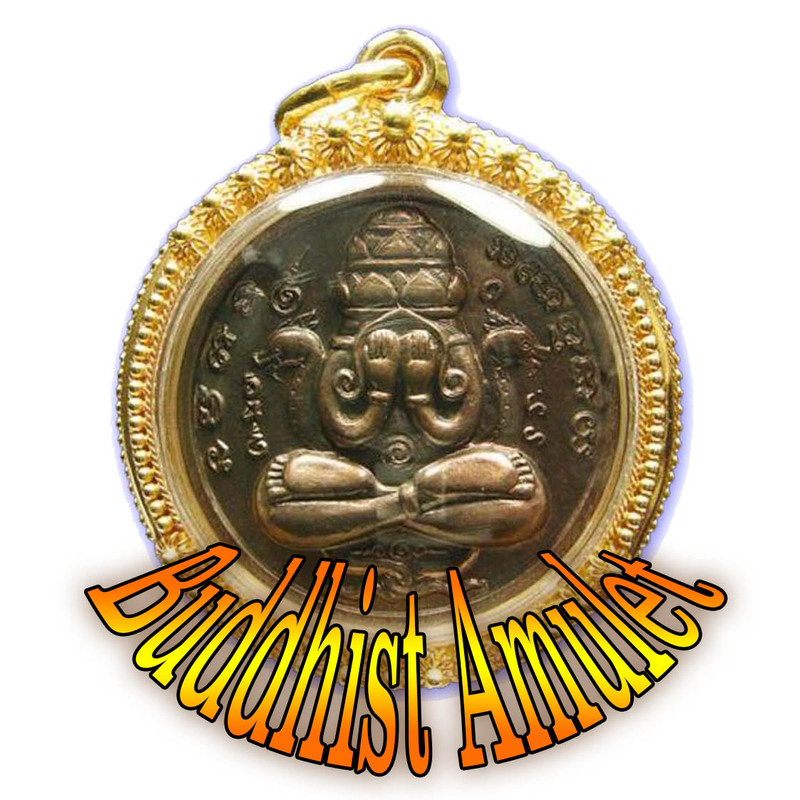 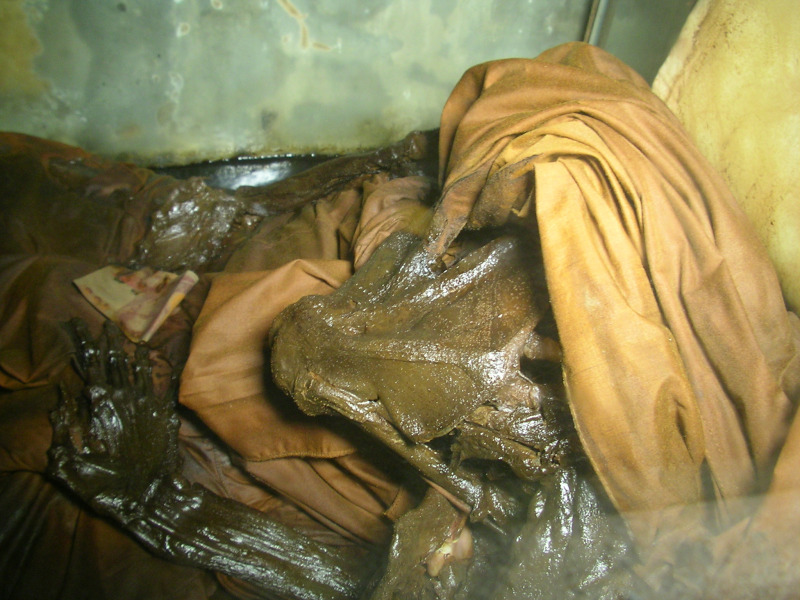 In fact it is believed that since Buddhism sprang out of the roots of Brahman Cosmology, and that the people of Siam adopted Pre-Buddhist Brahman traditions and incorporated them, that this is even a benefit to the preservation of ancient knowledge, and of Thai history and tradition. 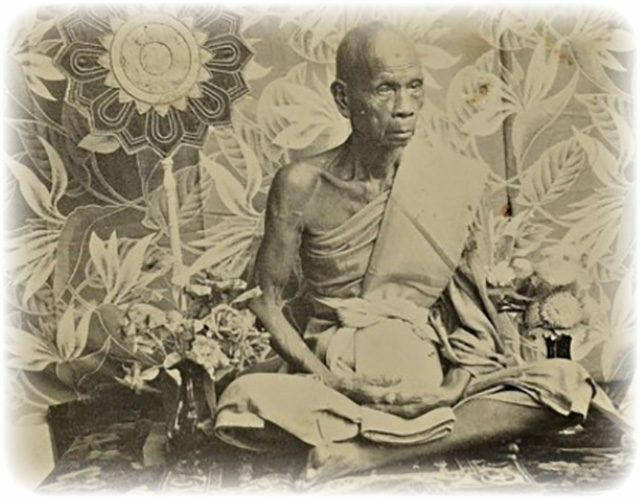 Most of these ceremonies do not come into any kind of dispute with Buddhist thought. 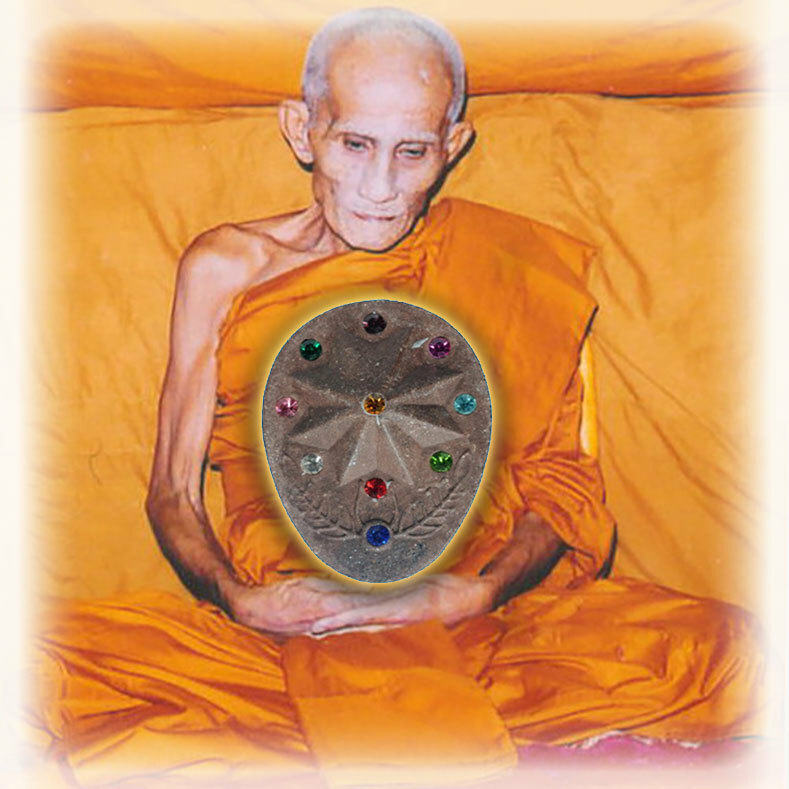 In fact, Buddhist Thought bases itself on many concepts found in Hinduism, and in Thailand, the two Beleif Systems can hardly be separated.